England stars Courtney Lawes and Tom Wood will make their first Saints appearances of the new season after being named in the team to face Newcastle Falcons at stadium:mk on Saturday (kick-off 1.45pm). Lawes has recovered from a knee injury sustained during England’s disappointing World Cup campaign, while Wood, who also played in the tournament, returns after being given last weekend off. The third and final change to the side that lost 13-12 at Worcester Warriors in last Friday’s Aviva Premiership opener comes at centre, where George Pisi starts alongside Luther Burrell. Michael Paterson, Jon Fisher and Tom Stephenson are the men to drop out. Paterson and Fisher are named among the replacements, with Ahsee Tuala also on the bench for the first time this season. Calum Clark (shoulder) and James Wilson (arm) are still sidelined, while George North is rested following his World Cup exertions with Wales. Newcastle, who were beaten 39-27 by Gloucester at Kingston Park last Friday, hand a debut to Tonga captain Nili Latu. 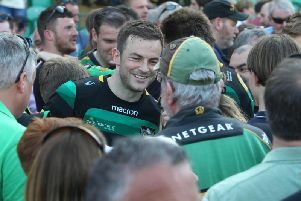 Saints: Foden; K Pisi, G Pisi, Burrell, Elliott; Myler, Dickson; A Waller, Hartley, Brookes; Lawes, Day; Gibson, Wood, Dickinson. Replacements: Haywood, E Waller, Hill, Paterson, Fisher, Fotuali’i, Hanrahan, Tuala. Newcastle Falcons: Hammersley; Venditti, Harris, Powell, Tuilagi; Delany Tipuna; Vickers, Lawson, Welsh; Green, Furno; Clever, Latu, Hogg.